As the name implies, Word Counter is a character count tool that is utilized in counting the number of words online. A lot of times, website owner desires to know the number of words on their websites, article writers are also usually concerned about the number of their words because of certain word count limitations. Before now, word count is done manually, nowadays, many tools are available to help you achieve this goal. Word counter online is a tool that has been designed to help you know the number of words of a particular content. Quick And Accessible Word Count Checker: translators often require word count of a web page because they usually charge clients by the number of words on a certain webpage they are translating due to the time it requires to translate words, hence, it is important to be able to quickly access information about the specific number of word count a web page has through a word count checker. Reader’s Checker: readers who are interested in knowing the number of words of a particular article or web page can easily use our word count checker. Writer’s Guide: our word count checker is useful for writers who want information about the word character or count of their article, especially if he wants to style his writing after blogger or writer he admires. Our word count checker is very useful in helping writers develop a better website or blog that they desire. Site Owners Must Use: site owners use the word count checker to check the pages of their website or blog. Knowing the most popular pages of our website can help you discover their word count and character which would help you in performing better with other topics you write about later. Writing Content: our word count checker can help you in developing a good writing content and optimizing it with regards to the search engine in the future. Traffic: knowing the word count on your webpage can help you attract more traffic to your blog or website. What Is The Right Word Count For Your Content? While long-form contents usually rank higher and are shared better, shorter words are also not necessarily worthless. In fact, a 500-word piece can be as good as a 1200 word article. Moreover, the fact that a long piece of content has double word count is not a guarantee that it will do well. Creating a large number of short content pieces to boost SEO ranking will not actually achieve this goal, a comprehensive analysis of Google’s search engine has shown that long-form content is given a higher preference by a search engine. In 2014, the highest ranking content was only a little more than 900 words and in the following years, it has been between the average of 1,100 and 1,300 words. If this trend continues, it means that Google prefers longer pieces of content. Google purposefully highlights longer contents that contain all the required topics in a more comprehensive manner. Knowing this, it is better to have a good Google ranking by taking out time to develop and write longer and more comprehensible words that are Google friendly rather than focusing on short topics that will only serve as an introduction to a complex topic. 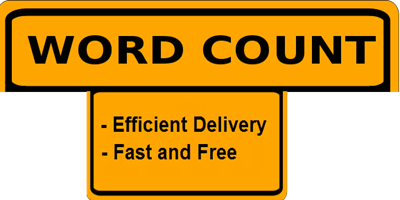 Efficient delivery: we know the importance of having a good word count checker so we offer you an efficient one that does this with ease. Fast: our word count checker is fast so it is time-saving. Free: yes, you do not need to pay a particular sum of money to assess our word count checker, it is absolutely free.